Location: Sauron's fortress tower in Mordor, on a long spur of the Ered Lithui (Ash Mountains) that projects southwest onto the Valley of Gorgoroth. 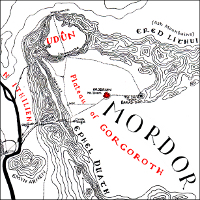 The Valley of Gorgoroth, showing the Barad-dûr on the tip of a spur of Ered Lithui. 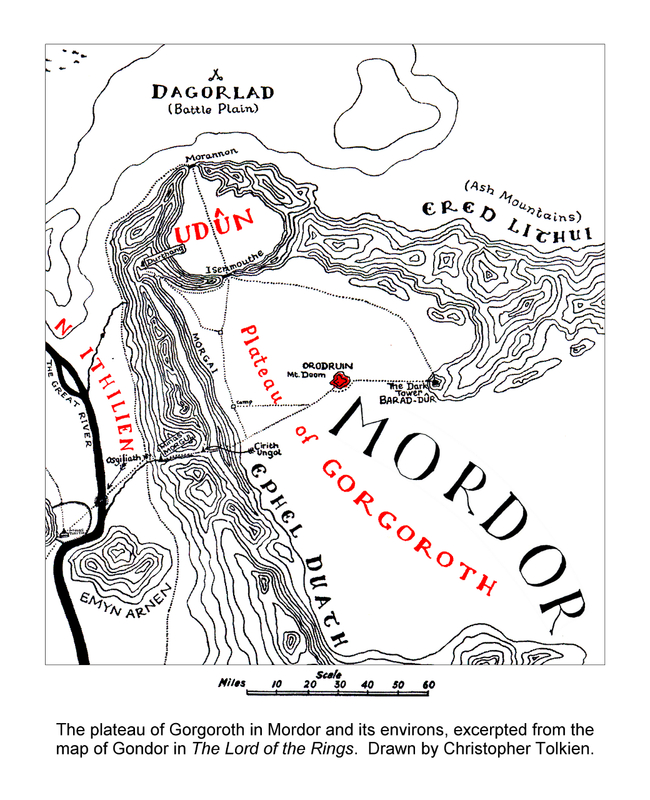 [The] Mountain of Fire... stood nigh to Barad-dûr; and the valley of Gorgoroth was filled with ash. Behind [Mount Doom] there hung a vast shadow, ominous as a thunder-cloud, the veils of Barad-dûr that was reared far away upon a long spur of the Ashen Mountains thrust down from the North.... [All the Dark Power's] great stronghold, gate on gate, and tower on tower, was wrapped in a brooding gloom. [Isengard] was naught, only a little copy..., of that vast fortress, armoury, prison, furnace of great power, Barad-dûr, the Dark Tower, which suffered no rival, and laughed at flattery, biding its time, secure in its pride and its immeasurable strength. [As] Frodo... claimed [the Ring] for his own..., the Power in Barad-dûr was shaken, and the Tower trembled from its foundations to its proud and bitter crown.